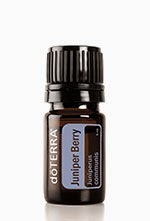 Juniper Berry Doterra Essential Oil is the September 2014 Product of the Month. The woody, spicy, yet fresh aroma of Juniper Berry reveals its rich history of traditional use and therapeutic benefits. natural cleansing agent, both internally and externally. Juniper Berry helps to cleanse and purify the air. eyes, inner ears and sensitive areas.